The 2013 Chrysler Town & Country S is unveiled before the LA Auto Show as a new trim level in the Chrysler S-series of trim packaged models. 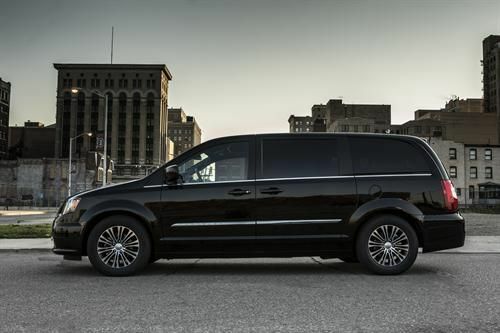 Chrysler, which holds the dubious title of "inventor of the minivan," is showing off the latest entry into its S family of high-trim models, the Town & Country S. The minivan joins the 200 and 300 sedans in the S family with new interior and exterior appointments befitting higher end modern styling. The van will physically debut at the Los Angeles International Auto Show and will be available in dealerships shortly after that. Enhancements and added standard equipment is the hallmark of the S family and the 2013 Town & Country S will be set apart from its brethren by exclusive paint color options. Exclusive colors include Brilliant Black (shown), Deep Cherry Red, Stone White and Billet Silver. Added trim helps contrast these by foregoing the usual bright exterior treatments the van carries with a more sinister black chrome grille and black-background Chrysler Winged badges. Exclusive S-model badges will also accompany. Other blacked out additions will be seen in the headlight bezels, polished face wheels with black-painted pockets, etc. Inside, a monotone black interior will be unique to the Town & Country S as Black Torino leather seating (with S-logos) and black Ballistic cloth seat inserts set off the exclusive trim. More black will be seen on the instrument panel and steering wheel, which also sports the Chrysler Winged badges in black background to match the exterior badges. Options will include a segment-exclusive Blu-Ray DVD system with HDMI input and standard USB and 12v outlets plus a 115v two-prong outlet. Higher-definition screens have been added to the option and includes wireless headphones. For the driver, a performance suspension has been added to the Town & Country S trim to give better dynamics to the van that already holds the title of having the most horsepower in its class. The van's 3.6-liter V6 produces 283 hp and, with its 6-speed automatic transmission, receives 17 mpg in the city and 25 mpg on the highway by EPA estimates. That picture is the least terrible mini-van I have ever seen. I am not at all a fan, but I understand some families need a vehicle of this type. If I were the dad owning this I might be able to hold my head high as I parked outside the store to buy diapers. I like the mags the best.